Critics on Wednesday blasted a proposal circulated by Gov. Jerry Brown that could change the legal framework for determining whether utilities or their customers pay for future potential wildfire liabilities, calling the governor’s plan a measure that would shield PG&E from wildfire costs and create a bailout for a utility that’s already a convicted felon. The governor this week proposed a plan that could dramatically ease the future potential wildfire-related financial burdens on large utilities such as PG&E by potentially shoveling more costs onto ratepayers’ shoulders. Proposals by the governor and two lawmakers have drawn intense scrutiny and skepticism in the wake of fatal infernos last October that scorched the North Bay Wine Country and adjacent region. “PG&E has a long history of causing wildfires, creating explosions and poisoning communities,” Noreen Evans, a former state senator from Northern California, said Wednesday. “PG&E was on criminal probation at the time of the wildfires. I can’t believe that the governor’s plan is to let PG&E off the hook and make ratepayers liable for the wildfires.” Evans was in the state Legislature from 2004 to 2014. Fueled by optimism that wildfire-related political support for power companies could protect profits for PG&E and other utilities in California, Wall Street traders sent PG&E shares 1.2 percent higher Wednesday to close at $42.99. San Francisco-based PG&E has stumbled in recent years with problems involving its equipment and maintenance efforts, some with lethal consequences. PG&E was deemed to have caused a 2010 fatal gas explosion that killed eight people in San Bruno. In 2016, PG&E was found guilty in a federal trial of felonies it committed before and after the San Bruno explosion, a decision that branded PG&E as a convicted criminal. More recently, state fire investigators, in separate findings, determined that PG&E bore a measure of responsibility in 16 of the infernos last fall. 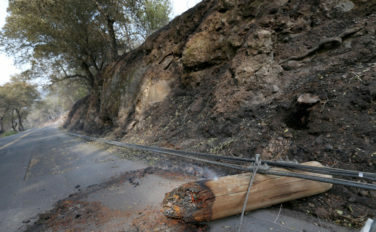 In addition, the Cal Fire investigators believe PG&E broke the law in 11 of those instances. PG&E, in an effort led by Chief Executive Officer Geisha Williams, is attempting to influence lawmakers to pass multiple bills to ease its financial exposure in case of wildfires. PG&E spokeswoman Lynsey Paulo said this week, “We look forward to reviewing the Governor’s statement and the upcoming work of the joint conference committee.” The company said Wednesday it was still studying the proposed legislation. Wednesday, the conference committee began to craft a plan to address potentially conflicting goals of forest management, the safety of residents and the utility liabilities and responsibilities. SB 901 will be the vehicle to steer solutions through the Legislature. Gov. Brown’s proposed legislation, however, would deliver a victory for PG&E and other utilities by shifting to ratepayers the future cost burden of strict liabilities that power companies now face under a legal theory known as inverse condemnation. That legal approach currently holds utilities and shareholders liable if their equipment was a factor in causing a wildfire or other disaster, even if the utility properly conducted maintenance and facilities upgrades. “The governor’s proposal is a non-starter,” Patrick McCallum, co-chair of Up From the Ashes, a coalition of North Bay wildfire victims, said Wednesday. Although the governor’s plan won’t erase PG&E liability for past fires, a separate measure, AB 33, would use state-backed bonds to finance, up front, billions of dollars in costs for the wildfires so victims could be paid rapidly. PG&E ratepayers would bankroll the bond repayment. The third bill, SB 1088, would allow PG&E and other power giants to simply be “substantially compliant” with fire-safety plans, regarding equipment maintenance and vegetation clearance. PG&E also has warned investors it faces bankruptcy if its liability is too severe. When confronted with massive penalties linked to the San Bruno disaster, PG&E warned it could go under. Eventually state regulators imposed a $1.6 billion penalty for the gas explosion. Despite its warnings, PG&E didn’t go bankrupt. Now, the utility is blaming climate change as a factor in the North Bay fires and other blazes.